Size: * 4 lb. 22 lb. 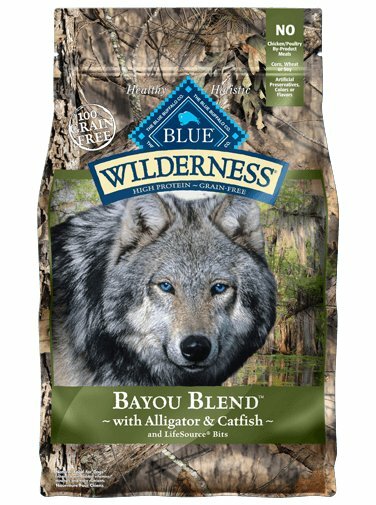 BLUE Wilderness Bayou Blend captures the exotic flavors of the Southern bayou whose waters provide a natural habitat for alligators, catfish and shrimp. This tasty, grain-free formula features nutritious, meat-rich alligator for a unique taste of America’s bayou that’s sure to satisfy your dog’s wild side. Made with the finest quality natural ingredients enhanced with vitamins and minerals. Deboned Alligator, Menhaden Fish Meal (source of Omega 3 Fatty Acids), Tapioca Starch, Peas, Potatoes, Pea Protein, Chicken Meal (source of Glucosamine), Dried Tomato Pomace (source of Lycopene), Dried Egg, Chicken Fat (preserved with Mixed Tocopherols), Deboned Catfish, Flaxseed (source of Omega 6 Fatty Acids), Natural Flavor, Fish Oil (source of DHA-Docosahexaenoic Acid and ARA-Arachidonic Acid), Shrimp Meal, Dehydrated Alfalfa Meal, Salt, DL-Methionine, Dried Chicory Root, Choline Chloride, Potato Starch, Calcium Carbonate, Caramel Color, Mixed Tocopherols, Sweet Potatoes, Carrots, Potassium Chloride, Vitamin E Supplement, Ferrous Sulfate, Iron Amino Acid Chelate, Zinc Amino Acid Chelate, Zinc Sulfate, Yucca Schidigera Extract, Oil of Rosemary, L-Lysine, Parsley, Dried Kelp, Blueberries, Cranberries, Apples, Spinach, Blackberries, Pomegranate, Pumpkin, Barley Grass, Turmeric, L-Ascorbyl-2-Polyphosphate (source of Vitamin C), Copper Sulfate, Copper Amino Acid Chelate, Nicotinic Acid (Vitamin B3), Taurine, Calcium Pantothenate (Vitamin B5), Biotin (Vitamin B7), Manganese Sulfate, Vitamin A Supplement, Manganese Amino Acid Chelate, L-Carnitine, Thiamine Mononitrate (Vitamin B1), Riboflavin (Vitamin B2), Vitamin D3 Supplement, Vitamin B12 Supplement, Vitamin B12 Supplement, Vitamin B12 is a coenzyme in nucleic acid, protein and lipid synthesis. It is necessary for growth. Necessary for normal processing of carbohydrates, protein, and fat in the body, Pyridoxine Hydrochloride (Vitamin B6), Beta Carotene, Dried Yeast, Dried Enterococcus faecium fermentation product, Dried Lactobacillus acidophilus fermentation product, Dried Aspergillus niger fermentation extract, Dried Trichoderma longibrachiatum fermentation extract, Dried Bacillus subtilis fermentation extract, Folic Acid (Vitamin B9), Calcium Iodate, Sodium Selenite.